I recently saw those advertising trucks driving around Chiang Mai, but this time instead of a movie or a big sale they were advertising a mobile application called Bribespot. I was quite surprised so looked it up. “Bribespot is anonymous service for reporting and tracking bribes online. We allow people to share their stories and explore interactive maps of their communities on the go - using our smartphone apps - and on our website. Artas Bartas proposed an international team of geeks & designers gathered at Garage 48 hackathon in Tallinn, Estonia to build a mobile app for tracking bribes. What started as a fun weekend geeking around & building a crude prototype, soon turned into an social project aimed to promote the use of clever technologies to tackle petty corruption. I thought this was quite interesting and wondered how many people were reporting in Thailand. It seems it hasn’t yet caught on here as there are 67 reports nationwide. A few from foreigners but most of the reports are in Thai. I wonder if this will catch on? Will it make a difference if it does? And if people know they can’t get out of breaking the law by paying a bribe will they still break the law? All interesting things to ponder. 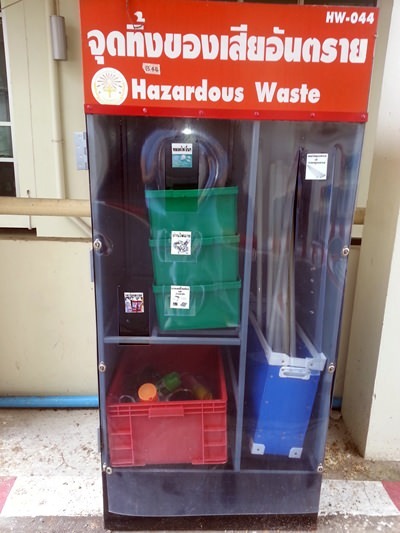 Recently someone asked in the newspaper about the bins for recycling hazardous waste. I recently visited the Tessaban offices with my wife across from the U.S. Consulate where I found this sitting in front of the new building. I remembered reading here that one was there and in front of Icon. We drove past Icon Plaza on the way to the Tessaban but I didn’t see one out in front. Maybe it is in the parking lot, but it is not on the street. However, there was this one so I happily dropped off my supply of used AA batteries and an old laptop battery. I was interested to see that they had a box for spray cans as well as one for fluorescent light tubes. I would like to know if any readers know of other more easily accessible places that I can find these bins as I am happy to send them in for proper disposal. This is an update on Air, the little Karen girl that was tortured by that couple in Kampaeng Phet. She is out of hospital and back at the Care Home in Kampaeng Phet. She can now use both her arms quite well and her back is a lot better. She will stay at the home where the administrators are meeting to find her a school to attend, they feel it will benefit Air to be with other youngsters of her age. Her Mother and Father visit her quite often and are able to live in Thailand. The Thai Government have paid for all her treatment, but as so much of her body was burnt with the boiling water not much can be done in the way of skin grafts. Such a shame. There is a trust fund set up for her, I hope to get to the Care Home next Month and see her and get details of the trust fund. I have written my autobiography, it won’t be a world’s best seller, but who knows, when it gets on Kindle it may sell (to my friends and family)! But any money received will go to the trust fund for Nong Air. I recently read a report that Thailand and China are planning to relax visa rules between the two countries. The visa waiver is expected to boost tourism in the region, I know that Japan recently also allowed Thai nationals to travel to the country without visas. I just hope that China will consider relaxing visa rules for foreigners that are not Thai as well. The Bank of Thailand has also expressed interest in using Yuan as a trading currency between the two nations in place of US dollar. Apparently China has agreed in principle, this is good news for the many expats who actually work in China but also have a home in Thailand. According to my bank, HSBC, they predict that by 2015, the yuan will become one of the three most used currencies in global trade, along with the dollar and euro.